Clear skies. Low around 60F. NNW winds shifting to ENE at 10 to 15 mph..
Clear skies. Low around 60F. NNW winds shifting to ENE at 10 to 15 mph. Daniris, Naomi and Lucas participate in an Ash Wednesday service at Epiphany Cathedral Catholic School. Above: Students at St. Mary Academy in Sarasota participate in Stations of the Cross. 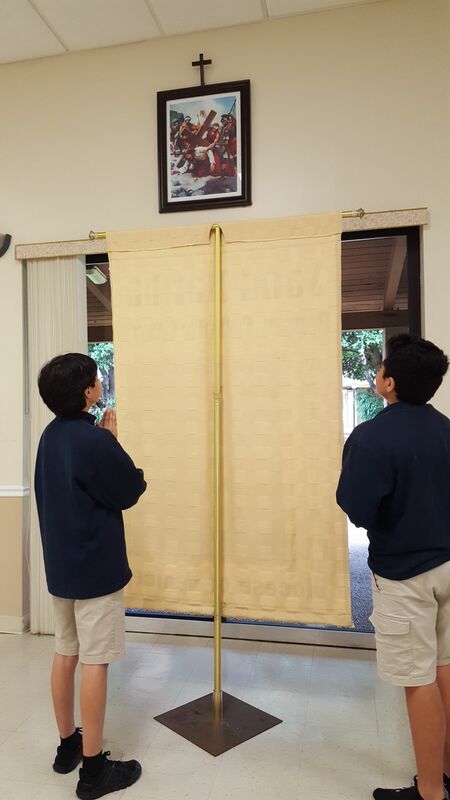 Students at St. Mary Academy in Sarasota participate in Stations of the Cross. Easter is a special time of the year for area Christian schools, including Venice Christian School and Epiphany Cathedral Catholic School in Venice and St. Mary Academy in Sarasota. Two of the activities they participate in during this time are Ash Wednesday services and Stations of the Cross. Venice Christian will celebrate Easter by inviting the students’ grandparents to attend a special chapel service on campus on Thursday, April 18, from 9-11 a.m. to sing praises to God, and worship the Lord with a message from Pastor Phil Schmunk of First Christian Church in Venice. Schools will be closed on Good Friday (April 19) for students to spend time with their families.